Do you journal? I just recently started up again. It is something I always enjoyed doing as a teenager but as I left the angst behind, I found I stopped writing down my thoughts and insights. As I’m growing older and my children are growing I’m being reminded of things from my youth and I want a record of those things that my kids can look back on someday when I am gone. I think documenting life events and even the day-to-day grind is important. It is one way historians are able to piece together the past and I want to make sure I’m a part of that! I found Lil Blue Boo’s The Journal Project and that was the perfect jumping point for me. I’ve followed some of her prompts on days where I didn’t have much to say and it has been really fun for me. As I began this process my son became immediately interested, especially when I showed him my neighborhood map. We live in the same neighborhood that I grew up in so he took a lot of pleasure seeing what it looked like circa the 1990’s while I was growing up here. It inspired him to want to journal as well, so I created a spiral bound book out of computer paper and he got to work. As a first grader he is continuing to learn to read and write and this is a great activity to help him in that process. He has asked me for some prompts, but mostly the journal pages he has created has been his on his own accord. His first entry was a neighborhood map. His second was one he did on the bus and then came home from school to share with me. Things what make me happy. Mom and Dad, My Familey. Things wht mak me mad. Parents. Parents forcing (me to go to bed). 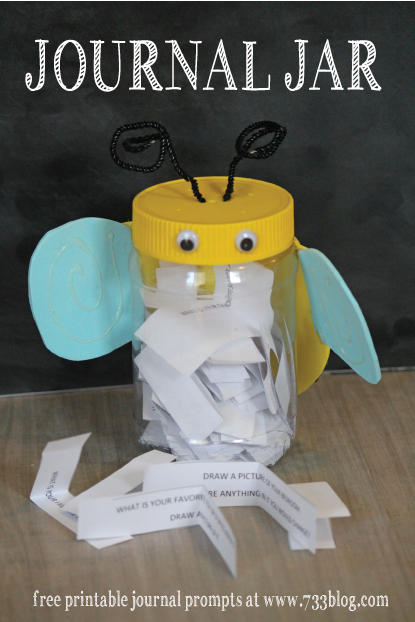 I decided to make up some journal prompts that I placed in a jar to help him pick a topic if he runs out of his own. 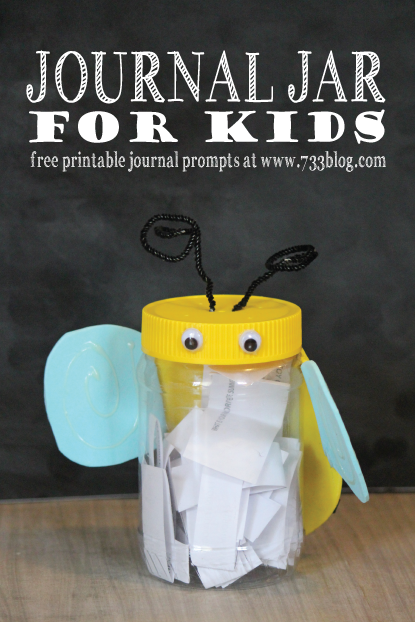 I’ve made them available as a printable that you can print and cut out to make your own Journal Jar. I love that this is a journey that my 6 year old and I can take together. It is something we have in common and get excited to share with one another. I’ve even taken some of his ideas and applied them into my own journal. We’re recording history one page at a time… and I absolutely cannot wait to share this copy of his life history with him when he is grown with children of his own! Do they already keep a journal? I would love to hear about some of their page ideas… maybe I can share them with my son! Thanks for the cute idea and freebie!